The Maxton Solar Farm began in 2011 as a partnership between developer O2 Energies and D&I Trucking, as they looked to find a productive use for the land behind their business. Today the 4.5-megawatt solar farm sits on 28 acres. Each year, the solar farm will generate 6,141 megawatt-hours of clean electricity when the sun is shining which is during times of peak demand. This is the equivalent of powering the electricity needs of 576 homes on an annual basis. Sheep are used to graze under the panels during the summer months to maintain the site, demonstrating a dual use for the land. This multi-million dollar investment created work for more than 120 individuals and over 30 local and in-state companies, setting the stage for a new era for renewable energy in North Carolina. We want to thank Progress Energy, REC Solar, the Robeson County Commissioners, the Robeson County Economic Development Commission, Robeson Community College, and the dedicated individuals who helped to make this project a success. 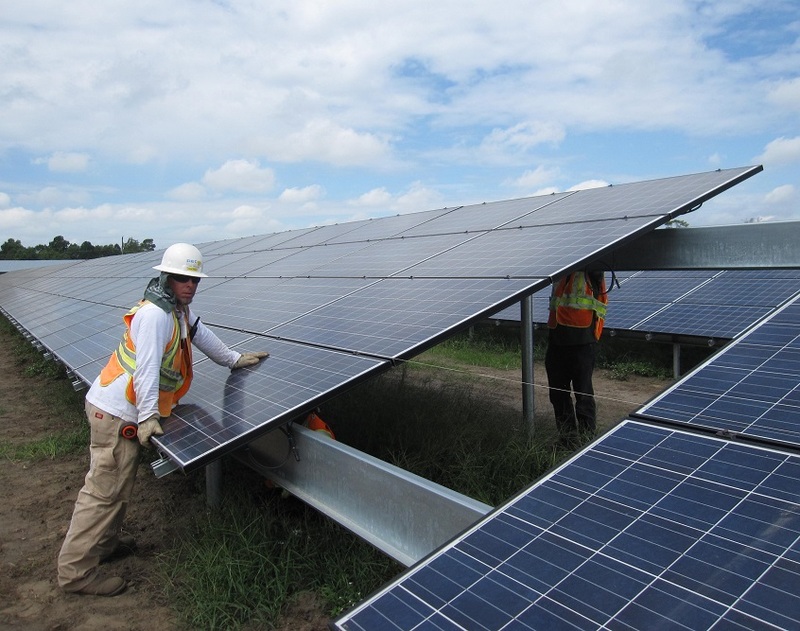 Click on the above image to see more pictures from the Maxton Solar Farm!